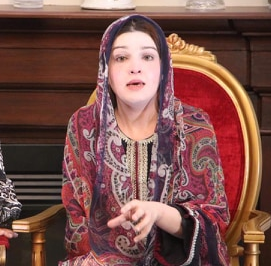 ISLAMABAD:April 10, 2019- Mushaal Hussein Mullick, a wife of Muhammad Yasin Malik, condemned the Indian authorities’ brutal act of shifting Yasin Malik from Kot Bhalwal Jail in Jammu to New Delhi’s infamous Tihar Jail and vowed that such inhuman and brutal tactics couldn’t dampen the courage of ‘Lion of Kashmir’. Addressing a press conference here on Wednesday, Chairperson Peace and Culture Organization lashed out at the Indian state barbarism and added that the Narendra Modi led Indian government have scared of the recent unprecedented surge of Kashmir movement of right to self-determination; hence he used all inhuman acts to silence the powerful voices. Mushaal warned that the Indian notorious Prime Minister should bear in mind that such brutal and inhuman acts could not deter the Kashmir freedom fighters and they would keep their struggle on till taking the movement of self-determination to its logical conclusion. She said that India unleashed its state barbarism for over 70 years during which thousands of Kashmiris were martyred and thousands of women were widows but the intensity of the movement has witnessed a considerable increase with each passing day, which is clear indication that Kashmiris could not be scared by such inhuman acts. “Yasin Malik, Chairman of Jammu and Kashmir Liberation Front, is seriously ill and due to detention his health is deteriorating with each passing day, but the Indian authorities shifted him to infamous Tihar Jail in New Delhi instead of providing him health facilities,” she lamented. She said that being a Pakistani citizen, she requested the incumbent Pakistan government to take the issue of Yasin Malick in international court of justice so as to ensure her meeting with the ailling husband and could ensure his treatment. Criticizing the world community, she said that it is really unfortunate that the world community, United Nation and Human Rights Organizations observed criminal silence over Indian state barbarism in the Indian Occupied Kashmir and have no courage to force the Indian government to sop the on-going genocide of innocent Kashmiris. She said that the government should chalk-out a strategy so as to raise the issue of Kashmir dispute at various international forums more effectively and vigorously to pressurise Indian government to ensure resolution of the issue as per aspirations of Kashmiripeople. The Chairperson vowed that though Indian brutal forces are using all inhuman tactics in the occupied valley, the Kashmiris couldn’t be deprived of their right of self-determination for long. Muhammad Yasin Malik was shifted to Tihar Jail after India’s National Investigation Agency (NIA) secured his production remand in connection with a false case registered against him. The JKLF Chairman was arrested on February 22, 2019 from Srinagar and later shifted to Kot Bhalwal Jail after being booked under draconian law, Public Safety Act. He will be facing questioning by the NIA now. The NIA had approached a special court in Jammu, seeking Yasin Malik’s remand for custodial interrogation in the case. It is to mention her that the JKLF was recently banned by the Indian government for its pro-freedom activities in occupied Kashmir. She said that Kashmiris are facing the worst kind of martial law as forces enter into the houses of Kashmiri people without any search warrant, which is not only shameful but inhuman act. Mushaal said that people in 21st century are deprived of their basic and fundamental rights; but unfortunately the world community observed criminal silence over the unabated Indian atrocities in IOK.